Nadi Legends Club (Fiji Soccer): INTERVIEW: Our interview with Bobby Tikaram (ex-Airport Soccer Club / Nadi Football), 14 August 2014. INTERVIEW: Our interview with Bobby Tikaram (ex-Airport Soccer Club / Nadi Football), 14 August 2014. Nadi and Fiji legends Savenaca Waqa (left) and Henry Dyer @ Navakai Housing, Namotomoto Village, Nadi, 27/8/2015. There was a great atmosphere at Nadi Football Association and Nadi Town in the early-1980s when Bobby Tikaram was VP and the district team won four national league titles in a row (1980-1983). Dr Kieran James (University of Fiji): How did you first meet Henry Dyer? Bobby Tikaram: During the 1970s and 1980s I was in my prime as far as sporting career was concerned. I was watching the Inter Secondary Schools tournament in Nadi. I was very surprised by the talent available. I was there for Nadi Soccer. I was technical adviser or manager. I was an official, most probably the manager of Nadi or technical adviser. I was surprised to see the talent available in this country. One of them that caught my eye that day was Henry Dyer. 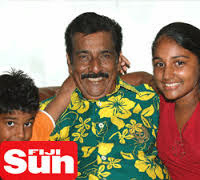 In fact at that time I was not able to do much although he was a native of Nadi as he was living in Lautoka and playing for a Lautoka secondary school. 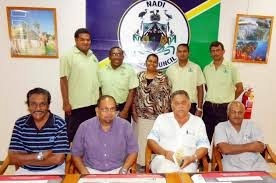 I did see other talents and I suggested five names for Nadi Soccer. I had to just see Henry Dyer and I could not progress further. The other five players I recruited were from Nadi College. I recruited them to join the Nadi squad. Those five were Peter Dean; Shiu Naiker; Shamin Zikar Ali (his father was a star Nadi player); John Satish Nath; and Bobby Ali. They all later went on to play for Nadi and some played for Fiji or moved abroad. As a matter of fact John Satish Nath is now the President of one of Fiji’s soccer associations in Auckland, New Zealand. KJ: What was your impression of Henry Dyer when you first saw him play at the trials? BT: It appeared Henry had a natural sporting athletic ability. His movements and positioning were very much like a gifted sportsman. No doubt he definitely impressed me. KJ: What position was he playing then? BT: At that time he was playing as a forward. When I met him he was mostly as a striker. Later in Nadi the coach started to move him backwards. I saw him as a striker and very talented. I thought he had the potential to play for Fiji. I thought if I can get him I can help to make him a national rep.
BT: The biggest surprise in my life came when I was based at Airport and I was a regular at the tennis club, rugby club, and soccer ground. My house was just next to the ground. I had a club Airport Soccer Club. I was there and he was there. KJ: Why was Henry there? BT: He was playing touch rugby at Airport Ground No. 1 with Airport Workers. I started yarning with him. I asked him: “Were you the same guy who played at the Secondary Schools tournament?” He said “yes”. He said that his parents are here [Nadi] and it is likely that he will stay here now. That was a good surprise for me. It fits into my plan. I asked whether he would like to play for Airport Club. Another thing which caught my eye while they were training with the Airport rugby boys was his ability to play rugby. I thought: “My God, this guy has talent; he is a natural rugby player too”. He confirmed to me that he played soccer for Ba Provincial School. This is when my relationship with Henry Dyer began. Our friendship has remained the same until today. I introduced myself as President of Airport Soccer Club and official of Nadi Soccer Association. At that time Airport SC was a renowned affiliate of Nadi Soccer Association where we provided players like Stan Morrell; Emasi “Bacardi” Koroi; Marika Ravula; Amani “Pele” Rokoderea; John Satish Nath; Jack Johnson; Samu Vucago; and not forgetting Akariva Rasumin. Another obvious thing I saw was that he was training rugby barefooted. I asked him if he had soccer boots. He said “no” and I said “I will buy you one pair”. That started his club career. 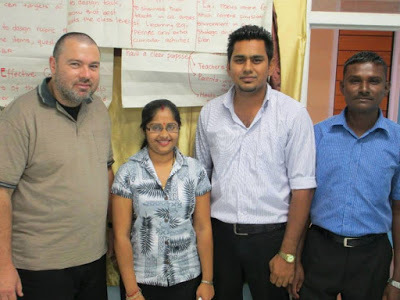 Henry Dyer back at Nadi Sangam School (2015). KJ: What was Henry like as a player in his early days at Airport SC? BT: Henry was phenomenal in his games for Airport with the support of the other talented players in the team. We went on to win the knockout league tournaments in Nadi. His performances for Airport Soccer Club met the approval also of Nadi’s soccer coach. His first soccer coaches were Mani Naicker and Joe Lutumailagi. After only a couple of games for Airport SC he was asked to join the Nadi Soccer Association squad. Henry Dyer: It was after one game Bob. BT: After only one game for Airport SC he was asked to join the Nadi Soccer Association squad. His first game was against Blues Soccer Club at Nadi Sangam School Grounds which we won 1-0. BT: His first game was against Blues Soccer Club at Nadi Sangam School Grounds which we won 2-0. Henry scored the first goal and Bacardi scored the second goal. KJ: OK, can we move on to talk about the famous 1982 IDC Final between Ba and Nadi in Nadi where the penalty shoot-out took place and then play was stopped due to alleged bad light? BT: In 1981 Henry Dyer was selected for the IDC squad but he was not in the team. One of our strikers Rusiate Waqa (whom I also introduced to Nadi soccer) was red-carded in 1981. They looked for Henry but he was not there. This opened the doors for Henry to join the squad in the following year as there was no other suitable striker. He was working for South Seas then. HD: Someone called me at work and said: “they are paging you at the stadium”. My name was in the non-travelling squad for the 1981 IDC but not in the final 17. BT: Rusiate Waqa’s absence opened the door for Henry to be drafted into Nadi Soccer’s squad. This gave Henry an opportunity to cover for Rusiate Waqa. KJ: Did Henry continue to play rugby during his early days at Airport SC? BT: While Henry was playing for Airport SC he was playing rugby for Lautoka Colts. His talent in rugby was also noticed by former Nadi and Fiji half-back Samisoni Viriviri Senior. Because of his commitment to Nadi Soccer he found it hard to combine the two and so he continued to play soccer and did not play rugby for Nadi. I was helping him on the field and off the field at that time up until today. It’s not like I saw him, used him, and forgot about him. I don’t see him as a teabag. He came to my work a couple of times asking for help. I helped him and some of the other players sometimes. All the players that I took under my wings were very faithful and very supportive of my requests; there are no doubts about that. BT: By now Henry Dyer was a regular with the Nadi squad and was selected in the first XI to play in the 1982 IDC Final in Nadi. The game at full-time was 0-0. HD: The game reverted to penalty-kicks. It was 6-6 after ten kicks each. Save Waqa was about to take the eleventh kick. I knew he was injured. He was injected by Dr. Fong. I kicked the sixth kick and it was a goal. When it came to Save’s turn little did we know that Ba was about to protest about the floodlights. They did not know that Save could not kick. He could not stand in goal to take any more pain to defend. BT: When the game was postponed it was noted that the game be played in Nadi as the venue for the tournament was Nadi. The whole Nadi soccer community was shocked to learn it would be played at a neutral ground Lautoka. No other game in the world had [had the venue] changed for a replay after light had stopped play. In a meeting with Nadi and Ba officials Ba confirmed they would not appear in the replay as they agreed it should be played in Nadi which was the official venue of the IDC. However, this argument did not hold water and Ba appeared in Lautoka for the replay and the rest is history because Ba took the trophy. KJ: Do you remember how Henry performed in the final in Nadi? BT: Henry Dyer played the game of his life and was at his peak. While in defence he clashed with Joe Tubuna and injured his head. However, he refused to give up and played on as if nothing had happened. Tubuna had to be taken to Nadi Hospital for stitches. You have to give full credit to both teams. They wanted the best and gave their best. After the treatment at Nadi Hospital he [Joe Tubuna] returned to the ground desperate to play but was advised by Ba officials that he had already been replaced by another player. In 2015 Henry Dyer replicates his first goal for Airport Soccer Club against Blues Soccer Club at Nadi Sangam School Grounds in 1981.